Texas got a major economic boost on Dec. 18, 2015. That’s the day Congress ended the 40-year-old U.S. export ban on crude oil. Overnight, the market for light sweet Texas crude went from domestic to worldwide. The decision was a much-needed stimulus for the Texas fracking industry, especially in the Eagle Ford and Permian Basin. European countries were also pleased the ban was lifted because it reduced their dependence on Russian and African oil. Political and economic instability makes light crude supplies from countries such as Libya and Nigeria problematic. Even China is looking at U.S. crude oil to reduce its dependence on Middle Eastern oil. U.S. crude oil exports soared from 392,000 barrels per day in December 2015 to one million in April. That’s an increase of approximately 155 percent in less than two years (Figure 1) and is 11 percent of the nation’s total output. Canada was exempt from the ban. The U.S. had been exporting crude oil to our northern neighbor in limited amounts since the early 1990s and sporadically to other countries. In 2016, the top export destinations for U.S. crude oil were Canada (57.9 percent), the Netherlands (7.3 percent), Curacao (5.7 percent), China (4.3 percent), Italy (4.1 percent), and the United Kingdom (3.1 percent). 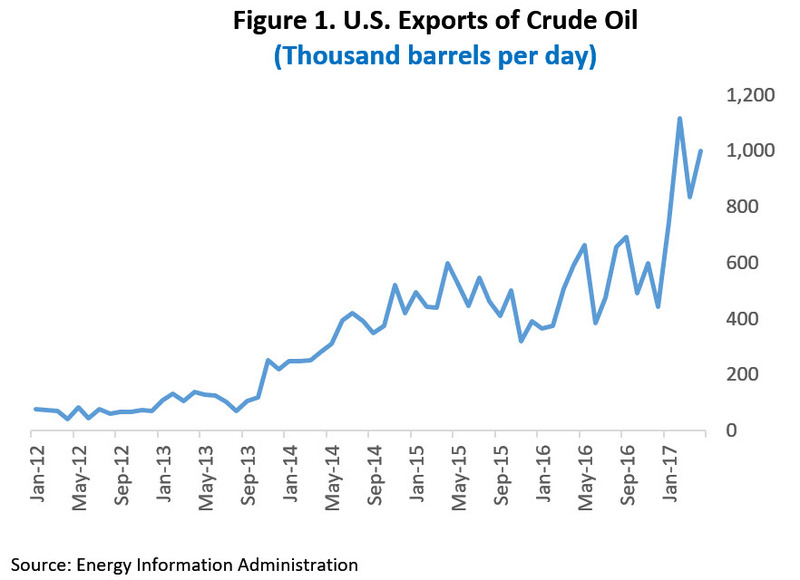 Rising crude oil exports allow the U.S. to gain international market share at a time when the Organization of Petroleum Exporting Countries (OPEC) is reducing output in an attempt to shrink the global oil supply. If strong U.S. export growth continues, West Texas Intermediate (WTI) may replace Brent Crude as the global benchmark for sweet light high-grade crude oil. ​Texas crude oil exports gushed from approximately $319.3 million in December 2015 to $1,061.4 million in May (Figure 2). This was 65 percent of U.S. crude exports. 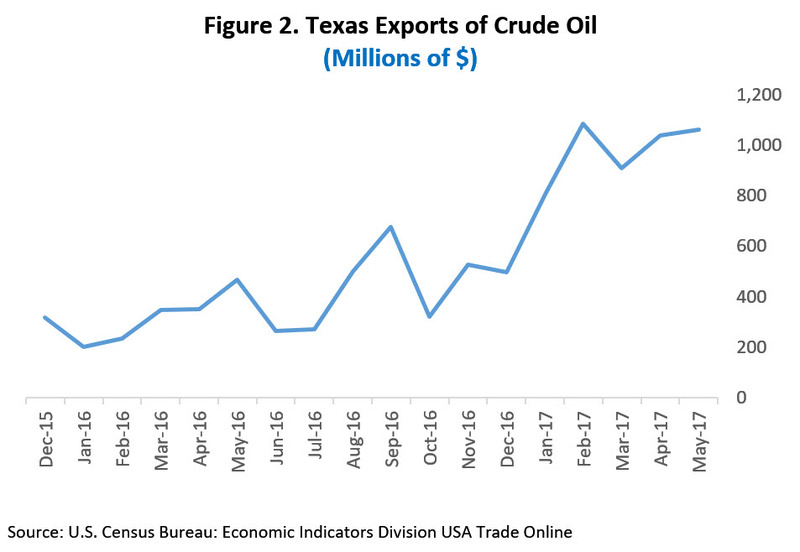 In 2016, Texas oil traveled to Canada (28.3 percent), the Netherlands (15.4 percent), Curacao (10.7 percent), Italy (7.3 percent), and China and the United Kingdom (5.1 percent each). Year to date (May), however, China is the top export market for Texas crude oil.